Keiko Hsu, CPC, ACC is an award-winning, certified Life Coach, Business and Executive Coach, Life-After-Divorce Mentor, Speaker, and Founder of Wings for Women®. Her passion is coaching, mentoring, and inspiring busy, career-focused women after a life-shaking transition such as divorce or career change … and helping them to find their wings, reach new heights in their life, career and relationships, and live a joyful life. Her personal experiences in transforming her own life after divorce and career change, plus her expert coaching skills and extensive corporate leadership experience, uniquely enable Keiko to serve women who are navigating through life-after-divorce, life-after-corporate, or a major career shift. Her clients get clarity, courage and confidence from her wisdom and her 5-step WINGS process that transforms their lives. Keiko is well known for being positive and resilient during challenging situations, seeing the silver lining in the clouds, living life full out, and manifesting her dreams and deepest desires. Her clients say she is courageous, inspiring, focused, accomplished, honest, and very professional. An inspiring radio talk show host, Keiko’s Wings for Women® Radio Show is accessible at http://WingsForWomenRadio.net and on iTunes. It features interviews of women who are thriving after divorce. 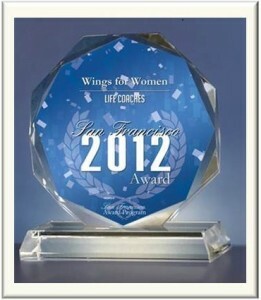 Wings for Women® won the 2012 San Francisco Award for Life Coaching. Keiko is a board member and Past President of the International Coach Federation’s (ICF) San Francisco chapter, a certified Dream Coach®, and graduate of the Institute for Professional Excellence in Coaching (iPEC). She is a former executive with General Electric Company, where she held various sales, marketing, and leadership positions and led numerous strategic corporate initiatives during her 28 year GE career. She has a Civil Engineering degree from Duke University. Born in Tokyo, she grew up on U.S. military bases in Okinawa and Japan. She was the first person in her family to immigrate to the United States. She loves to ski, golf, travel, listen to contemporary jazz, and appreciate beautiful scenery in her recently adopted city of San Francisco. Contact Keiko and explore if coaching is right for you. Request a complimentary Consultation/Life Strategy Session by phone by filling out a brief online Request Form here.